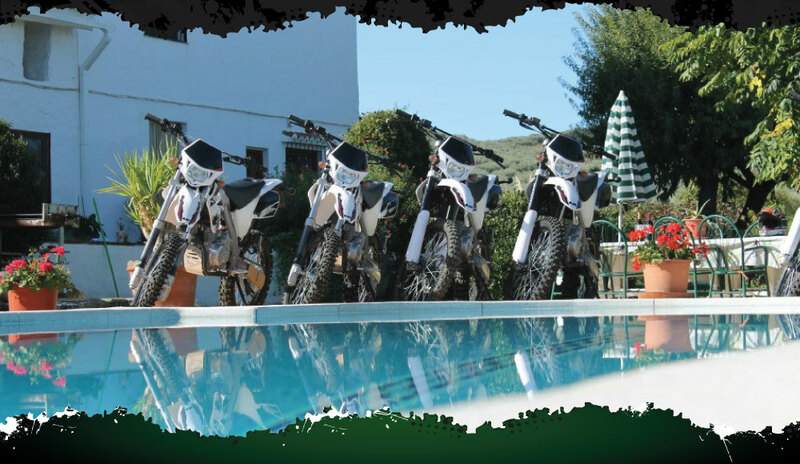 Our Bikes - Off-Road Motorcycle Holidays in Spain. Trail Riding in Spain. PR3 – 240cc air cooled carburetted engine. These bikes are absolutely loved by our shorter guests, being specifically designed to give shorter riders confidence, enabling them to reach the ground. A big plus off road. Equally it has the fantastically smooth powerful and torquey 240 cc engine the bigger PR4 has. Also, a fantastic frame and suspension, plus a low centre of gravity. PR4 – This bike shares the fantastic 240cc air cooled engine and it ensures confidence off-road with its smooth progressive power delivery. Its single cylinder engine provides more than enough power and torque to ride the trails easily. Equally the experienced rider will love the suspension and the lightness when off-road. The rider will feel the bike come alive and feel how nimble it is when stood up on the pegs aided by its awesome frame and low centre of gravity. PR5 – This is a liquid cooled fuel injection 250cc bike. The combination of this powerful single cylinder engine and the bikes fantastically designed frame and low centre of gravity, give this bike the agility of a smaller bike and the ability of a larger bike. AJP may not be an internationally well-known major manufacturer, but what we do use is a range of bikes hand built, designed by a European multi enduro championship winner. They are a winner with all our riders, many owning bigger major manufacturer bikes, all leave giving our bikes a glowing recommendation. Its built for riders. Providing strength power and agility. The flagship model range from AJP, the PR5. Featuring an a liquid cooled 250cc four stroke single cylinder engine in AJPs trademark composite alloy/steel frame, the PR5 offers all the benefits of the established competition brands but at a fraction of the price. For another year we’ve selected AJP as our fleet supplier in Spain. The Portuguese manufacturer continue to go from strength to strength, with new models in their range that we just couldn’t resist! We’re replacing our air-cooled bikes with new liquid cooled 250cc models, which are slightly more powerful and a few kilo’s lighter than the previous bikes. Our 200cc options have also been replaced by slightly more powerful 240cc bikes, we keep the smaller PR3 at hand to cater for shorter riders or those who need a little more confidence. FRONT / REAR TIRES 90/90 - 21" / 120/80 - 18"
The AJP PR3 is a unique bike, thanks to it's smaller wheels and reduced height chassis design, the PR3 could be considered a 3/4 size bike, ideal for shorter in the leg riders or for those that just prefer a smaller bike for increased confidence. FRONT / REAR TIRES 70/100-19 / 100/100-17"